Runs off 2 x 18v Li-on batteries (not supplied). Supplied with guide bar, chain and guide bar cover in cardboard box. Chain Speed 0- 20 m/sec. 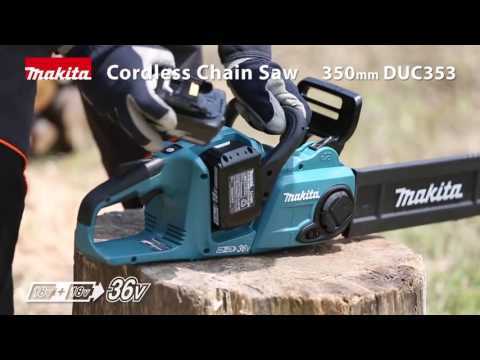 The Makita DUC353Z is the new brushless twin 18v cordless chainsaw with takes 2 18v li-on makita batteries (not supplied). The chainsaw has variable speed control by trigger, Constant speed control and an adjustment lever for easier tool-less tension adjustment of saw chain. The duc353z has an electric chain brake and a kickback brake. 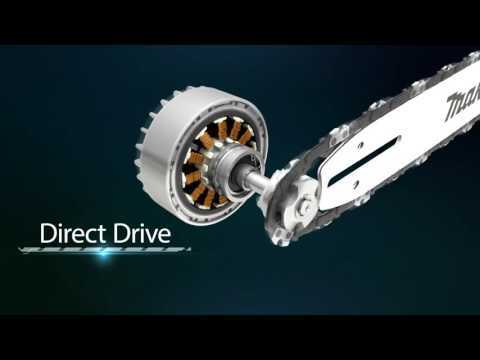 Powered by two 18V Li-ion batteries in series to supply energy to the powerful 36V DC motor drive system. 1 years warranty on this machine. Well designed for durable use; Strong in power and easy to use even for an amateur. Makita 196741-5 DUC353Z Or DUC355Z Replacement Chainsaw Chain 35cm 14"